My Buglife calendar arrived today. I was super keen to look at it as it contained all the winners of the Buglife Photography Competition. One of my bees was a winner – the photo I took of an Halictus sp bee sitting on a blade of grass in Warwick Gardens won a ‘Highly Commended’. 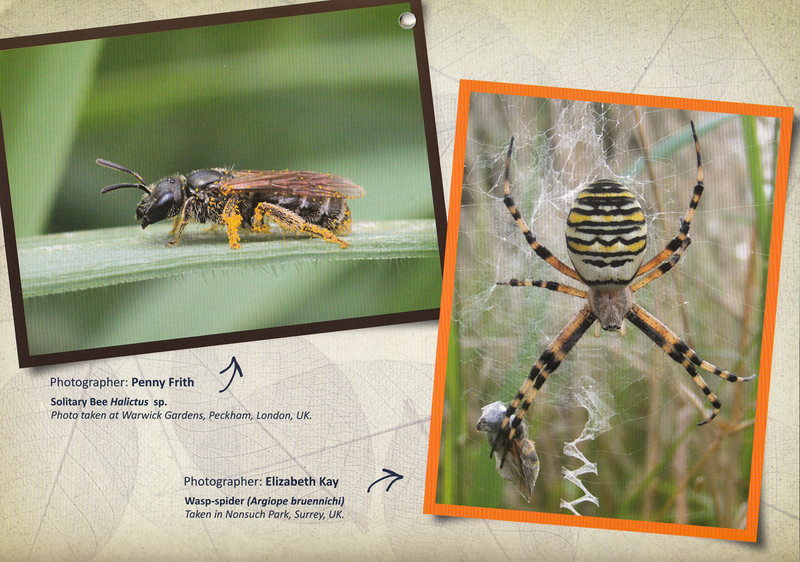 It represents the month of May and shares the space with a lovely Wasp-spider taken by Elizabeth Kay. The competition was held on Flickr and Buglife asked people to join their group and post their photos. This is amateur photographer territory – and to me the essence of passionate wildlife photography. What I liked about this competition was the free-for-all feel to it – and was open to everyone who had taken a picture of an insect in the UK. Invertebrates rarely win photo competitions – I think judges overlook the skill it takes to hone in on a tiny winged insect with compound eyes and take a photo before it flies off. Most wildlife photography awards nod to birds and mammals and the capture of the ‘perfect moment’ of a whale jumping out of the sea or a lion about to jump a gnu, and usually demand a payment to enter. Many of us don’t have the equipment to take such stunningly perfect photos or the time and money to visit the exotic locations to see the wildlife that usually win these competitions, let alone the entrance fee to enter. Some of us just have cheap cameras and limited habitats. Having had a look through the 1300 images that had been submitted I was stunned at the quality of photos. All the more reason to celebrate my win! As a graphic designer working in the world of urban conservation I spend a lot of time on Flickr looking for wildlife images to include in my designs, and I find some of the best photos are taken by people who don’t class themselves as ‘photographers’. They have a passion for their subject – be it badgers, birds or bumblebees. The Buglife calendar reflects this passion and has sawfly larvae, ant-lion, snails and slugs and cockchafers, and Chris Dresh’s stunning winning photo of a Raft-spider catching a Golden-ringed dragonfly. Marvellous. Congratulations to all the winners, and to Buglife for hosting a great competition. This entry was posted in Insectinside, Peckham, Penny Metal, Urban wildlife, Warwick Gardens and tagged Bee, Buglife, Buglife Photography Competition 2013, Halictus sp, Insectinside, Peckham, Penny Metal, Solitary bee, Warwick Gardens by insectinside. Bookmark the permalink.